Some people sit around a table with their player character described on a sheet of paper in front of them. The Game Master (GM) sits at the end of the table hiding his secrets behind a cardboard screen. The GM tells the players what their characters see and what they meet. The players respond by saying what their character does. Whenever there is a chance of failure, a dice is rolled to see if the character is successful in that task. The players usually play only one character each. The GM plays every non-player character (NPC) the player characters (PCs) meet. Small metal miniatures are sometimes used to represent the PCs and NPCs, especially to help track combat situations. What is the Amar RPG? Amar is two things: a) A realistic rule system that guides the GM and players in the game. The rules makes it possible to easily determine if a risky task like attacking the troll under the bridge is successful. And b) Amar is a fantasy world where the game play takes place. This site covers the rules of the game as well as information about the Amar fantasy world. This is the site of the Amar RPG. The game is the result of more than 33 years of development and play testing. Its forerunner, The Mega Role-Playing System (Fantasy Edition) was published in the UK in 1987 and aimed to be the most realistic RPG. The target audience was seasoned RPG players. An RPG simulating real life was bound to be quite complicated and thus cumbersome. The developers (Geir Isene and Bent Brakas) decided to cut down and simplify the rule system. While still maintaining a high degree of realism, the rules were simplified and simplified and simplified. Until the rules themselves were only a small fraction of Mega. The system is now one of the simplest yet most realistic. The Amar RPG uses only a 6 sided dice (d6) for determining outcomes of risky events. It is easily learned by the Game Master in an evening. The players catch on in an hour or two. No sweat. Just pure role-playing fun. Here is a podcast that will give you a 20 minute introduction to the creativity, fun and excitement of Role-Playing Games in general and the Amar RPG in particular: What are Role-Playing Games? This wiki gives you the complete game system as well as information on the Kingdom of Amar. You will also find online character and random encounter generators (NPCG) – useful tools for the Game Master. To help you understand the rules better, our contributor, Katageek, has written a story that exemplifies the rules in a simple way: Amar rules 101. 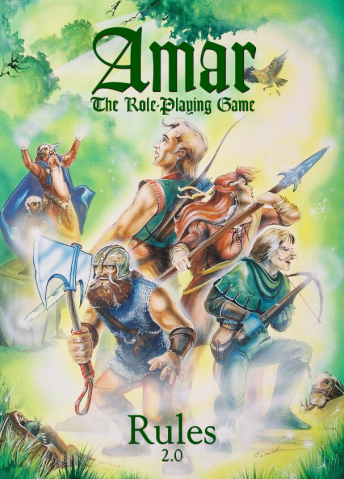 Introduction – an introduction to role-playing and the Amar RPG. The Character – rules covering character generation, attributes, skills and the experience system. Combat – rules covering melee and missile weapons, armour and … combat. Equipment – all kinds of goods and equipment as well as salaries for various professions. Magick – rules covering magick and all the various spells. Movement and Weather – rules covering movement in different terrains and weather conditions. Encounters – description of humanoids and monsters. The Rise to Infamy – a short story giving the background to Amar. Mythology – the creation of the world, current religions and the calendar. The World - information about the world in which the Kingdom of Amar resides. The Kingdom of Amar – an introduction to the Kingdom of Amar. Advice to the GM – tips for new GMs. The First Adventure – to get a fresh GM started. Amar Tools - online generator for encounters, NPCs, Villages/Cities/Towns, residents relations, weather and more. Compacting information - Adventure descriptions to the point - create information with no bloat. Image Library – lots of graphics, floor plans, etc. Free for personal use. To create your own Amar RPG book, click Create a book at the bottom of the menu to the left and collect the pages you want in the book. Contact Geir Isene (g@isene.com) to register as a user and contribute to this wiki. You will receive an e-mail with basic information on how to correct errors in the text, add new skills, spells or rituals, potions or magical items or new creatures. 2018-09: Added a podcast giving a 20 minute introduction to Role-Playing Games. 2018-08: Major upgrade of the Amar Tools. Major upgrades to the Gods: Attributes on all Gods and more Gods included. 2018-06: Lots of changes to magick - new spells, a brand new magic system proposal. Plenty of other changes since the beginning of 2018.